WASHINGTON (CNS) — The driver of a vehicle who caused the death of a Washington Catholic high school student said the compassion shown to her after the accident by the boy’s parents was the “most profound” experience of grace she has felt in her life. The driver, Margaret “Maggie” Baisley, was a 24-year-old doctoral student in clinical psychology at the time of the November 2014 crash that killed Dominik Pettey, who attended Jesuit-run Gonzaga College High School in Washington. She said she became humbled and changed in a “billion different ways” when his parents, Magdalena and Patrick Pettey, showed mercy by offering their prayers and by asking a local prosecutor not to charge her with manslaughter. Baisley said the parents’ request to meet with her and express concern for her well-being led to a positive change in all of her relationships, professionally and personally. Magdalena Pettey, a daily churchgoer and eucharistic minister at St. Bartholomew Catholic Church in Bethesda, Maryland, now gives talks about the value of divine mercy and said that she and her husband chose to forgive Baisley because they knew it is what Jesus would want of them. “I previously wasn’t so conscious of remaining nonjudgmental,” said Baisley, who added that she had been “very critical” of herself before witnessing the kindness of Mr. and Mrs. Pettey, of Potomac, Maryland, who also have a son, Nicholas, and a daughter, Veronika. Baisley said she now is “more gentle” in her assessment of herself and others, as she tries to adopt some of the parents’ compassion. When Baisley’s attorney mentioned that the parents of the high school student who died in the car that she struck with her Jeep Compass wanted to talk to her within days of the accident, she did not know what to expect. 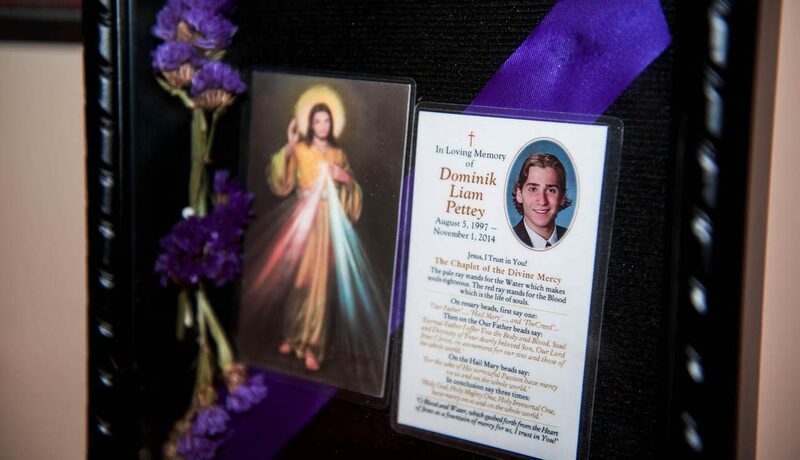 Even though the police gave Baisley three traffic tickets and found her responsible for causing the accident, Dominik’s parents became the personification of mercy. With the legal parts of her case concluded, Baisley spoke about the night of Nov. 1, 2014, when her vehicle drifted from the road on the Capital Beltway in Maryland and collided with a disabled Honda Accord in which Dominik Pettey sat in the back seat behind the driver as he and a carful of friends from Gonzaga College High School waited for assistance. Their vehicle had run out of gas and the father of one of his companions was just minutes away from arriving with a can of gasoline when the crash occurred. “I was certainly tired,” Baisley said as she recalled driving home that night after attending her sister’s 21st birthday party and having “a couple of drinks” while with her family. Nor was she legally intoxicated, based on her blood alcohol content, said Baisley, who declined to share her actual reading to avoid speculation from others about whether her driving may have been impaired by her consumption of alcohol before the accident. “I definitely was not drunk or wasted behind the wheel,” Baisley said, despite initial media reports that indicated she may have been intoxicated at the time of the crash. The combination of fatigue and consuming alcohol that night showed that driving while “not totally on your game” could have life or death consequences, said Baisley, who added she now has a “zero-tolerance policy” in which she will not drive when she is tired or has been drinking any alcohol. In addition, Baisley has been able to continue her education at the Uniformed Services University in Bethesda and pursue her dream of helping to counsel members of the military. Mr. and Mrs. Pettey gave Baisley an “incredible gift from an emotional, spiritual and practical level” when they wrote a letter to the prosecutor asking that she not receive a manslaughter charge that would have led to her discharge from the U.S. Army. But when she remembers the Petteys’ mercy, it helps her to cope and “keep moving,” Baisley said. A graduate of Jesuit-run Fordham University, Baisley said she appreciates that the mercy shown by the Pettey family led her to become “re-engaged with an organized religious community,” even though outside the Catholic Church. “Spiritually, I would describe myself as a Christian, not as part of the Catholic Church necessarily,” Baisley said. Even though she was raised in an Irish Catholic family and was confirmed in the eighth grade, Baisley said she never previously had the experience of “feeling connected and accepted” within the church community. She also said she had stopped going to church after her confirmation and prior to attending a public high school in New Jersey where she graduated. “We moved to New Jersey just before 9/11, where our family had a front-row view to the smoky New York City skyline, which I think impacted a lot of my future thinking,” Baisley shared. Baisley, who grew up in New York, California and then New Jersey as the second oldest of her family’s six children, said she felt the Catholic Church was “didactic,” required “memorization” and de-emphasized “spiritual aspects” of the faith. PREVIOUS: What would Jesus do on Halloween? You were legally drunk when you killed him- your blood test was performed hours after you arrived to the hospital and by then it had dropped down. You are fortunate that you have someone as gracious and forgiving as the Petteys on your side- every other parent I talked to would have thrown you in jail. In addition to the damage you did that night, the school community was devastated and you caused it by YOUR drunk driving. Your viewpoint really goes against what the Gonzaga community learned from this tragic event. Sure it was awful and everybody was devastated but I think you could really learn a lot about yourself and what it means to be a Gonzaga Eagle from the approach the Petty’s are taking. Please remember that you are not Dominik’s parents. The whole point of forgiveness is to heal and move on. By holding onto hate, you prevent that important healing from occurring. By forgiving Baisley, she was able to grow as a person. What good would throwing her in jail have done? It would have wrecked her life, and removed her from society, when she really isn’t a threat to anyone. We all make mistakes. I bet all drivers have driven at times when they were more tired than they should have been. Baisley just happened to be the unlucky one. She was probably hated herself after the incident, as most of us would be, but does she really need to hate of other’s too? No. We should instead help her to heal and use this case to help prevent something similar from happening again. In many ways the school was brought together in remembrance of Dom, not “devastated” like you suggest. There were banners in the gym from schools all over the DC area bringing messages of love to Gonzaga to help the entire community heal, including Baisley. You seem to insist that she was drunk. She was drinking, but not drunk. You are not an expert. You were not there. This idea came from initial news reports, but they can be deceiving because most of their facts come from rumors. Your views do not represent those of the Gonzaga community. While we have moved on from the incident (not forgetting, but healed to the point where this event does not affect us negatively, AKA the definition of forgiveness!) you dwell on the hate of this woman you have probably never even met! Hate is tempting, but don’t give in! I am not Catholic, but you don’t have to be Catholic to recognize the power of forgiveness.